When word first arrived that the G-20 would be meeting in Pittsburgh Pennsylvania, activists began organizing protest demonstrations. Events like this are what freedom of speech is made for. What better occasion to protest than a meeting of the world’s 20 top leaders — most of them deservedly hated — where they will be imposing policy on billions of people worldwide? “…the police were out in force, patrolling on bicycles, foot and horseback, by river and by air … protesters trying to march toward the convention center…encountered roaming squads of police officers carrying plastic shields and batons. The police fired a sound cannon (a new weapon) that emitted shrill beeps … then threw tear gas canisters that released clouds of white smoke and stun grenades that exploded with sharp flashes of light.” Rubber bullets were used in a separate incident. “Riot fences lined the sidewalks. Police helicopters, gunboats and Humvees darted to and fro. City officials announced they had up to 1,000 jail cells ready after county officials freed up additional space last week by releasing 300 people who had been arrested on minor probation violations.” (September 25, 2009). What threat required such a military-like response? None was given. The New York Times article and many like it imply that the mere existence of marching protesters warrants a colossal reaction. 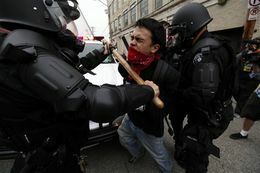 Of course the presence of “anarchists” is used to further scare readers into accepting such foolishness, as if this breed of protester is especially lethal (the vast majority of anarchists are like all protesters — they do not attack the police or anybody else, though some protesters respond aggressively when being confronted with the above mentioned police weapons). The G-20 police presence is not a terrible surprise to anyone who has attended a legitimate, community-organized protest over the years. Non-provoked usage of brutal weaponry is becoming commonplace; the police-enforced use of “free speech zones” at protests — small areas surrounded by fences in some cases — is nothing new. But the staggering police presence at the G-20 confirms that the stakes have been raised. Two turning points that deserve special attention — since the mainstream media continues to ignore them — are last years Democratic and Republican National Conventions. In both cases incredible abuses of police powers were witnessed, with the Republican Convention (RNC) showcasing the most extreme cases of state repression. At the RNC the unlawful tactic of mass arrests were used when, in separate incidents, a public park and bridge were surrounded by police, trapping everyone in the dragnet. The documentary, Terrorizing Dissent, has excellent footage of both episodes (www.terrorizingdissent.org). Police brutality was also a regular occurrence at the RNC — including much unnecessary usage of pepper spray and tasers — while occurring alongside an even more troubling episode. The group now referred to as the RNC 8 consists of eight community organizers potentially facing years in jail for helping organize protests at the RNC. The original charge was the Orwellian Conspiracy to Riot in the second degree in Furtherance of Terrorism (other terrorism-related charges were later added). These terrorism charges were the first ever usage of the Patriot Act toward political activists. And although the terrorism provisions of the charges have since been dropped, due to public pressure, the attempt to equate terrorism with activism has incredible, non-accidental implications for the future. When the Patriot Act was first enacted, there was no shortage of writers and activists warning about the potential of misuse. These predictions have been fully confirmed. Both the Military Commissions Act and the Patriot Act have created what many believe to be the framework for a full-fledged police state, with the initial flurry of abuses creating a series of dangerous precedents. One famous precedent is the so-called Telecom scandal, where tele-communication corporations colluded with the Bush-controlled National Security Agency to illegally spy on an unknown number of innocent people. No one has gone to jail for this. Indeed, as a Senator, Obama was one of many Democrats who supported Bush’s telecom immunity bill, which excuses those who broke the law while creating new powers to make spying on Americans legal. Equally outrageous is the Military Commissions Act, created under Bush to destroy a fundamental democratic right: habeas corpus, or due process. This right says that the government cannot jail a person unless there is proof of crimes committed, while also giving that person a chance to challenge these charges in a legal court with a jury. Obama continues to uphold Bush’s destruction of due process. Obama has said publicly that many so-called enemy combatants held at Guantanamo Bay will be held “indefinitely” without being tried for their alleged crimes. Supposedly, they are “the worst of the worst.” If this is true then evidence should be produced to prove it, since anyone can accuse anybody of the most heinous crimes. Without evidence, however, such accusations correctly fall on deaf ears. But no more. Now, accusations of “terrorist activities” warrant life sentences. No crime need be committed, only a vague intention — even if such intentions were formed by the suggestions of an FBI informant and are impossible to implement. The media blares these absurd “terrorist plots” as facts, and the rationale behind the destruction of civil liberties is re-enforced. It must not be forgotten that many of the “crimes” Guantanamo Bay inmates are being accused of are merely acts of resistance to the military occupations of Iraq and Afghanistan, something they have every right to do. “The air base is about to undergo a $60 [million] (£42m) expansion that will double its size, meaning it can house five times as many prisoners as remain at Guantanamo.” (February 22, 2009). Not only will Bagram continue to be an institution of terror, but also some analysts estimate that there remain 18,000 people held worldwide in foreign U.S. facilities — so-called black sites — with no legal rights. The absence of even Red Cross observation at these prisons insures that “harsh interrogations” (torture) will remain a regular habit. The above abuses of the Patriot Act have trickled down from high-profile terrorism cases (some who have made confessions under torture), to regular usage against alleged gang members, drug dealers and immigrants. For example, one section of the Patriot Act gives police the power to search people’s home secretly without notifying the homeowner — called “sneak and peeks,” a blatant violation of the Fourth Amendment. The logic again was that “special powers” were needed to track down “terrorists.” The Huffington Post reported, “Only three of the 763 “sneak-and-peek” requests in fiscal year 2008 involved terrorism cases… Sixty-five percent were drug cases.” (September 23, 2009). The illegal entry and searching of immigrant’s homes — or anyone suspected of being an immigrant — is widely known by the Latino community and continues to include the terror-inducing tactics of pre-dawn raids with guns drawn. Once anti-constitutional behavior is applied to alleged terrorists, and extended to immigrants and people suspected of being gang members or drug dealers, such police behavior becomes normalized, and can then be easily expanded to all people accused of being “criminals.” Police are widely known to consider political activists, protesters, and striking workers as criminal types, beliefs encouraged by the mainstream media. Which brings us to why? Why does the destruction of democratic rights that accelerated under Bush continue with Obama? With every political “why” question one must first answer: who benefits? In this case the benefiting parties are the giant corporations that dominate politics in the U.S. The people steering these companies had good foresight: they saw that the global capitalist economy necessitated a race to the bottom for workers’ living standards. As U.S. corporations faced stiffer competition abroad for international markets, wages and benefits for U.S. workers would have to shrink, especially when U.S. corporations were investing heavily in emerging economies — China, India, etc., — for their slave wages. U.S. corporate executives also understood that China became a police state out of necessity, so that its dollar-a-day workers could be brought into line (U.S. corporate investment rose sharply after the Tiananmen Square massacre). The trend of U.S. workers’ wages leads logically to similar conclusions. The creation of NAFTA to extend the dominance of U.S. corporations to Mexico and Canada would also have predictably negative effects on workers’ living standards. Now, with two unpopular wars taking place and a third on the way (Pakistan) to further extend the profit margins of U.S. corporations, a breaking point is nearing. Public money is being used to bail out banks and wage foreign wars while the recession continues to destroy jobs and drive down wages. This unpopular policy is viewed as a necessity for U.S. corporations, and Obama has no intention of reversing course. The police-state foundation created by Bush and continued under Obama is a stern warning to the U.S. working class to accept our fate or face dire consequences. It is already a fact that many people are too afraid of police repression to attend a protest, just as some workers are too afraid to be on a picket line during a strike. Ultimately, a real democracy cannot function where there exists tremendous inequalities in wealth, where large sections of the population are in poverty. This is why democracies are not viable in poor countries: the super-rich use their power over the state — including dictatorships and mass repression — to crush social movements that challenge the status quo, as we are witnessing today in Honduras. The same dynamic is being created in the United States, where the vast majority of people are clamoring for real change, while those in the two-party system are using all means available to keep their rotten system in place.